A new calendar for your room!!! 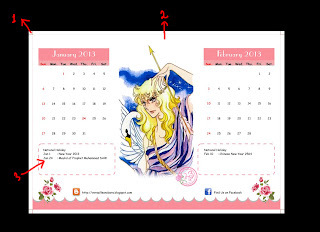 This Calendar contains indonesian national holiday, so I think you must edit it if you're not an indonesian. This file is in PDF, and you can edit it using Corel Draw or Adobe illustrator. 2. I put more white space here so that you can put the rings. This is my sample printed calendar. I suggest you to print it on art paper 260 grams, using laser printing. @Ratri: Bawa aja ke digital printing sis, jdi sekalian di print dan di jilid... kemarin pun saya gitu. Di digital printing pakenya print laser jadi tinta ga luntur.